The Hong Kong office of Henning Larsen designed The Springs for Tishman-Speyer, an American developer, with a holistic approach: Thinking beyond the present to future needs; integrating the local culture and community; and building a healthy and livable green habitat in the city. 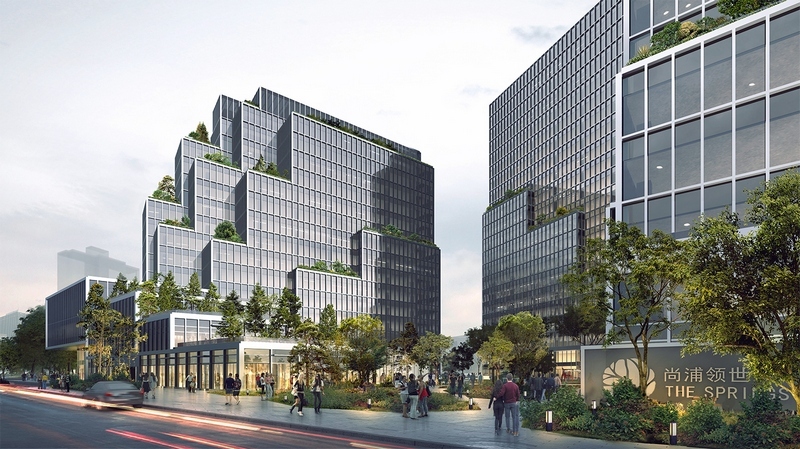 The project began construction on 12th July 2018 and expected to complete in 2020, providing a people-oriented, sustainable and innovative workspace to the Yangpu district – one of the fastest growing neighborhoods and education hubs in Shanghai. Developed around the concept of the Vale, the overall masterplan scheme positions the buildings around the periphery of the site forming an intimate space with a soothing microclimate through the center of the development. The massing of the buildings creates a public realm that improves air quality and reduces noise pollution while it brings natural light into the space. A plethora of greenery and several passageways create a public ground floor that encourages natural pedestrian flow from all surrounding areas and enhances the local community. 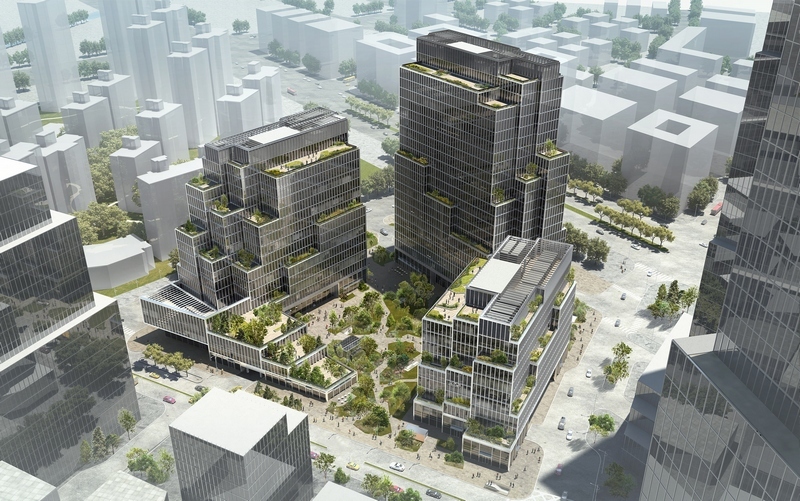 “We wanted to create a protected environment in this city center that contributes to the potential for this development to become a new focus that generates and attracts public life in uptown Shanghai,” Design Director and Partner, Claude Bøjer Godefroy explains. Inspired by “Shanshui” (the Chinese mountain scenery) the terraces and balconies of the stepped buildings are lushly planted. With the buildings totaling 114,400 square meters, the outdoor terraces located on every floor extend the ground floor landscape upwards, enhancing the working environment. Aimed at creating future-thinking workspaces for the creative industries, the three buildings provide wide product variety through multiple and flexible configurations. Generous communal spaces and shared facilities throughout the development enrich the community. Henning Larsen is a Copenhagen-based architectural studio with 7 offices worldwide. The studio specializes in identity-creating cultural buildings, educational institutions, headquarters, and urban planning. Their projects have been recipients of a number of prestigious awards including a Mies van der Rohe Award and two AIA International Design Awards. Within the office, HLA’s design teams have won over 35 design competitions in the last five years alone.